Carlisle Castle stands in a dominant position on the north side of the city of Carlisle close to the point at which the River Caldew flows into the River Eden. Built almost entirely of local red sandstone, this is not a pretty castle. Instead it looks very much what it is, a defensive stronghold in a location that has been of great military significance for the better part of two millennia, and whose standing remains have been built, developed and redeveloped almost continuously over the last 900 years. And throughout that time the castle has been an active military base. Even today some of the buildings in the outer ward continue to be used by the army, while one of the buildings in the inner ward is home to Cumbria's Military Museum: the museum of the Border Regiment and King's Own Royal Border Regiment. 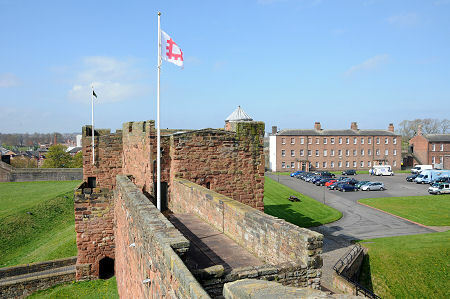 The older parts of Carlisle Castle are today in the care of English Heritage, which ensures their continuing care for the benefit of future generations, and their availability as a visitor attraction today. There is something very attractive about being able to visit a place which has played such a central role in the history of two countries, and at Carlisle Castle you can just about begin to imagine that you are walking in the footsteps of the many English Kings (and three Scottish Kings) who looked out over its ramparts for a first sight of a hostile army approaching from the north (or, sometimes, south). Or of the deposed Scottish Queen who was imprisoned here in 1567. A visit to Carlisle Castle is a must for anyone interested in the turbulent history of the northern half of these islands. It is arguable that the origins of Carlisle Castle can be traced back to the building here of a large Roman fort during the winter of AD 72-3. The fort was used, abandoned and re-used on a number of occasions over succeeding decades, before it took on a much more permanent form early in the following century as the largest of the forts built along the line of Hadrian's Wall, which passed just half a mile to the north. The fort spawned a large civilian settlement, and the town that grew up here was called Luguvalium, the forerunner of Carlisle itself. The Roman fort at Luguvalium was approximately square in shape, with typical rounded corners. Its northern wall lay under what later became Carlisle Castle, and its southern wall lay under what is now the Tuilie House Museum and the neighbouring buildings, on the south side of Castle Way. It takes no great archaeological detective to work out that this means that a large part of the centre of the fort lay under what is now the open ground between the defensive ditch in front of the castle and the modern dual carriageway. The remains here are well preserved below ground, and modern investigation of them has revealed much about the development of the fort, and of the town. It would seem that after the ending of central Roman authority in Britain in the early 400s, Luguvalium, and its fort, continued in use by the local population. By the late 600s the settlement here was a possession of the Kingdom of Northumbria, and in the late 800s it fell to the Vikings. In 1092 the Normans under King William Rufus took steps to consolidate their hold on northern England. As part of this process a castle was built here. This was probably a motte and bailey castle with wooden buildings. In 1122 King Henry I visited Carlisle and ordered the building of a stone castle, and stone walls to encircle the town. The structure that emerged forms the basis of the keep you can still see today. 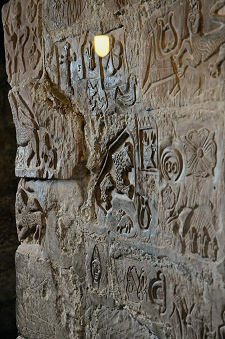 This was probably finished during the occupation of Carlisle by Scots under King David I, who captured the town in 1135. 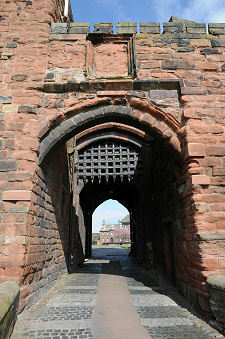 David died in Carlisle Castle in 1153 and his successor, Malcolm IV, ordered a Scottish withdrawal from Carlisle in 1157 in the face of growing English power under King Henry II. Henry ordered the strengthening of Carlisle Castle, and features you can see today such as the inner and outer wards, and the gatehouses protecting the entry to each, date back to this period. In the 1170s the newly strengthened castle was able to fend off two attacks and a siege by Scots under King William I. More work followed, including the building of what has been called a palace along the north side of the inner ward. In 1216 the city of Carlisle surrendered to Scots under King Alexander II, but the castle only fell after an extended siege that did considerable damage to its structure. The Scots departed after the death of King John of England in October 1216, and during the rest of the 1200s the already badly damaged castle fell into disuse and dereliction. Carlisle Castle resumed its central role during the Wars of Independence, during which King Edward I of England sought to annex Scotland. The "Hammer of the Scots" very nearly succeeded. Edward I's death in 1307 and his succession by the feeble Edward II restored the balance of power, and in July 1315 the Scots were once more at the gates of Carlisle Castle, under the command of King Robert the Bruce. This time their siege failed, largely because of appalling weather which hampered the movement of siege engines. For the following two centuries, Carlisle Castle became key to controlling the "West Marches", the areas either side of this end of the border. After the Battle of Flodden in 1513, the Scots were no longer seen as such a threat and Carlisle Castle again suffered from neglect. Widespread lawlessness replaced military conflict between the nations as the main problem, and it was internal rebellion within England that led to a major upgrade of the castle's defences in the mid 1500s. The result was a castle able to mount batteries of heavy artillery, and withstand attack by a similarly equipped enemy. 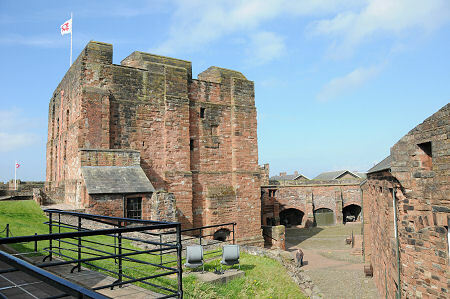 In May 1567 Mary Queen of Scots was held as a prisoner in Carlisle Castle after fleeing from Scotland. She was subsequently moved further south before her eventual execution in 1587. One incident that took place here in 1596 features large in the folklore of the Borders. William Armstrong of Kinmont (or "Kinmont Willie") was a notorious Border reiver (a polite euphemism for "bandit") who had been captured by the English Warden of the West March, Sir Thomas Scrope, and imprisoned in Carlisle Castle. On the night of 13 April 1596 he was freed by force by Scots led by the Scottish March Warden, Walter Scott of Buccleuch, Keeper of Liddesdale. The result was almost open warfare between two countries which only seven years later would share a king. The situation was eventually defused by a personal explanation given by Walter Scott of Buccleuch to Queen Elizabeth, who found him dashing and charming. During the English Civil War, Carlisle was occupied by Royalist forces and suffered a long siege that extended from October 1644 until its surrender in late June 1645. The castle was subsequently garrisoned by Parliamentary forces. By the 1730s the castle was once more in a state of disrepair, and this did little to help when the Jacobite army under Bonnie Prince Charlie turned up at the gates on 9 November 1745. After the Jacobite retreat north on 20 December towards their eventual demise at Culloden, the garrison they had left was besieged by the Duke of Cumberland for ten days until its surrender. Thirty one of the defenders were subsequently hanged, and the rest were transported as slaves to the Americas. The last major bout of redevelopment took place at Carlisle Castle during the fears of radical revolution that swept the country in the 1820s. Barracks were built in the outer ward, and these later served as the headquarters and training depot of the Border Regiment, formed by amalgamation of older regiments in 1881. 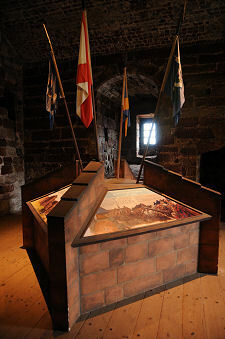 Today Carlisle Castle remains home to units of the Territorial Army and Army Cadet Force, and also houses the Regimental HQ of the King's Own Royal Border Regiment as well as Cumbria's Military Museum.